Annia Aurelia Faustina was an Anatolian Roman noblewoman. She was briefly married to the Roman emperor Elagabalus in 221 and thus a Roman empress. She was Elagabalus' third wife. The reason for their marriage is believed to be her ties to the Nerva-Antonine dynasty. 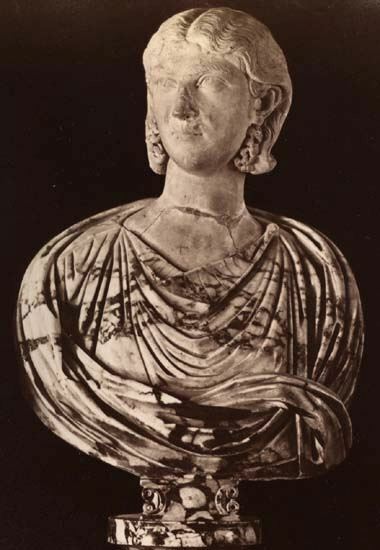 Elagabalus gave her the title of Augusta. In the end of 221, Elagabalus divorced her and returned to Julia Aquilia Severa, remarrying her as his fourth wife. There are no surviving sources describing Annia Aurelia Faustina's rule as a Roman empress. When her marriage to Elagabalus ended, Annia Aurelia Faustina returned with her children to her Pisidian estate where she died a year later - aged 22.